FAST-ACT provides an immediate response to eliminate chemical hazards and minimize exposure. The system has been proven to quickly contain and destroy a wide range of toxic chemicals, including chemical warfare agents. It can be safely applied to any toxic liquid spill or vapour release enabling Emergency Responders to utilize one product when faced with a wide variety of known or unknown chemical hazards. This family of products has utility for law enforcement, industrial, and public protection applications. Removes all toxic chemical vapours including H2S in minutes:It provides an immediate response to eliminate chemical hazards and minimize exposure. The system has been proven to quickly contain and destroy a wide range of toxic chemicals, including chemical warfare agents. It has a wide range of applications in the Hazmat, Maritime and Petrochemical Industries. 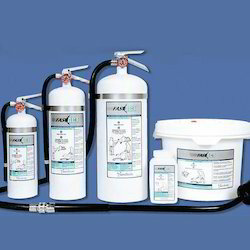 Unique Vapour Solutions for First Responders, tank cleaning, De-gassing and filtration for personnel protection.It is a combination of common metal oxides (MgO + TiO2) with a unique morphology. It has nanomaterial properties with a final particle size of nearly 5μm. The production process creates an altered, non-toxic molecular structure with large increase in porosity and surface area. This product has utility for law enforcement, industrial and public protection applications. Non Flammable - can be used for fire vapours. To fulfill the diverse requirements of our clients in the best possible manner we are passionately engaged in offering to our clients a wide range of Toxic Chemical Vapours and Spills Neutralizer.